B O D Y B O X is a participative videoinstallation and sculpture. 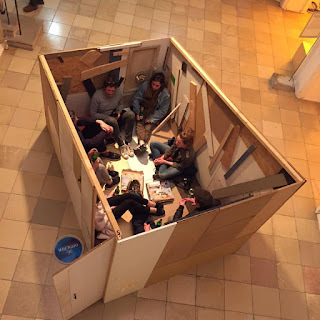 Through it´s open-closed structure, B O D Y B O X plays with parameters of intimacy and beeing watched. A performer provides videos to be used as movement instructions inside the box. Body becomes a dynamic and open principle of a W(HOLE) BODY. I have been very lucky to present bodybox at Springhouse Festival Dresden, taking place at Festspielhaus Hellerau, Dresden, Germany. The Box became an anchor for the group, participating at the festival and an intimate space for dialogue with the people entering the box. It has been an extraordinary experience to been in such direct contact with the audience and being able to exchange about the work immediately. We are here as part as a resedency programm, which has started on Monday. So great to be together with such special and talented people, living and working at fabulous Festspielhaus!